The vibrant city of Hong Kong offers a little for everyone. From shopping in the big streets from high end shops to the small and cute old-looking shops, to hiking up one of the mountains out of the many few which Hong Kong offers. Personally, it is one of my favourite cities that I visited in 2016 and am hopefully going to go back in a few months time. So what is there to see in this beautiful city? Let’s start with an obvious one, and everyone’s priority. If you are only in hong Kong for a short while, this should be on top of the list. To get that perfect city landscape photograph, either at night or during the day, you can take a trip up to the Peak. Keeping it traditional, taking the tram up to the Peak adds to the whole experience. The trams have been working since 1888 and slide past Hong Kong’s landscape including the famous skyscrapers as you are ascending up towards the peak. During this journey, you feel yourself on the tram going nearly vertical, and it gets your heart racing. Once you arrive at the peak you can enjoy the views surrounding you, with the vibrant city on one side and unbeatable mountain and coastline views on the other side. Stanley Market is situated on the other side of Hong Kong Island to where Causeway Bay is. It is a beautiful little town with a little something for everyone; whether it’s up-market shopping malls, or cute little markets selling more or less everything. The town is right by the sea so you get a breath-taking view of the seafront. Another reason to take a trip here is for the journey. Whether it is by bus, or car, you will get beautiful coastline and mountainous views, with the amusement park Ocean Park at the peak of one of the mountains, and the cable cars leading up to it. This beautiful island is a 20 minute ferry ride from Hong Kong Island. If you want to discover a little bit of old school Hong Kong, then this place is ideal for you. No cars on the island, everyone travels by foot or by bike (and some village motorised vehicles). This island is always on-the-go; whether it’s all the fishermen unloading from their boats in the harbour, or the locals settling down for their evening meal. Just a 15 minute walk across the island you will find yourself on the other side looking over the ocean from a fine-sanded and popular beach. The island in which the airport is located, Lantau is known for it’s mountainous sceneries and stunning nature. If you are looking for a nice hike, or just a long relaxing walk, then Lantau is the perfect resort, with plenty of peaks to climb up to and many beaches to walk along. The Lantau Peak is known to be the vantage point to catch Hong Kong’s sunrise. Amongst these mountains are two very popular beaches (Cheung Sha Beach and Pui O Beach) ideal for a cool dip, socialising with the locals or just spending a couple of hours relaxing on the sands. Based in Lantau, and a small village called Ngong Ping, is the Big Buddha and the Po Lin Monastery. You really can’t miss this one, especially if you take the cable cars up to Ngong Ping village. You get overwhelming views of the island and surrounding ocean views. Another reason to go is that there is free entrance to the whole village and the Big Buddha. Whether or not there is a fee, it is still all worth it. You get a visit from the local buffalos, can have a good taste from fresh Chinese food, and browse through some Chinese antique shops. 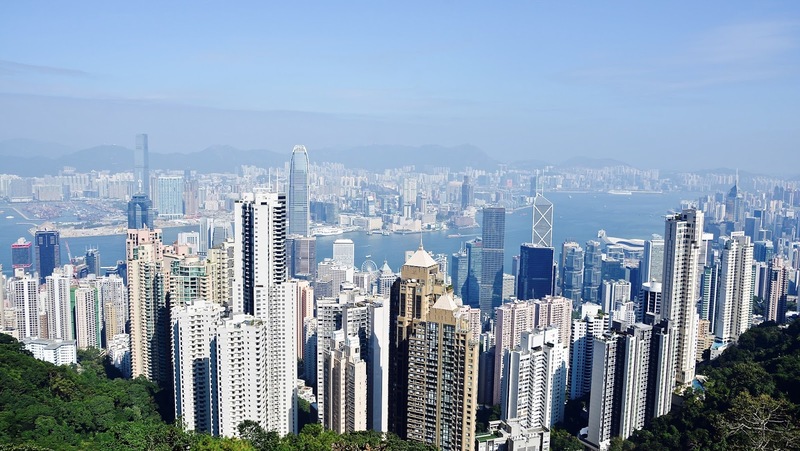 Have you been to any of these places in Hong Kong? I’ve only very briefly visited Hong Kong when I was 10 and was gutted I didn’t really get to explore it! It looks like an amazing city and that island sounds perfect. Ah yeah it’s an incredible city, one of my favourites! Ahh I loved Hong Kong!! Such an amazing city! We went to the peak and the big Buddha! Will have to check out the rest of these next time we go sounds amazing and cool for hikes and stuff like you said! We went to Disney aswell fab post! Isn’t it?! I want to go back so badly! Ohhh I loved seeing the Big Buddha, was so busy though haha! Ah, I bet Disney was wonderful!